Well, no one joined me for the Parade of the Classes on Class Day, Tuesday, May 15. You missed an excellent continental breakfast and mimosas. I again had to share holding the Class of '63 flag with a young assistant from the Alumni Office. What can Columbia do to make this a more attractive event for alumni? Class Day was beautiful this year on the Columbia campus. I hope next year we have a decent turnout. Here are some photos from the day. 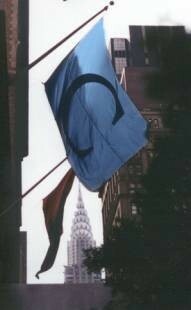 Please join your classmates for an informal lunch at the Columbia Club every second Thursday of the month. It is our hope that these gatherings will renew old friendships and foster improved relationship with our class and the College. I hope you can all join us at the next lunches on Thursday, June 14 and July 12 . Let me know if you will attend so that we can reserve a big enough table; RSVP to Paul Neshamkin (pauln@helpauthors.com). On May 10, seven classmates gathered at the Columbia Club Gill Room for lunch. The 7 who attended included regulars Joe Applebaum (up from Washington, D.C.), Steve Barcan, Doron Gopstein, Lee Lowenfish, Paul Neshamkin, Larry Neuman, and Tom O'Connor. We were joined again by a small group of members of the Class of '64. They included Fred Kantor, Larry Kessler, and Norman Olch. As I suggested last month, in the future, it might be interesting to try to bring together a larger gathering of the classes that overlapped our years at Columbia. 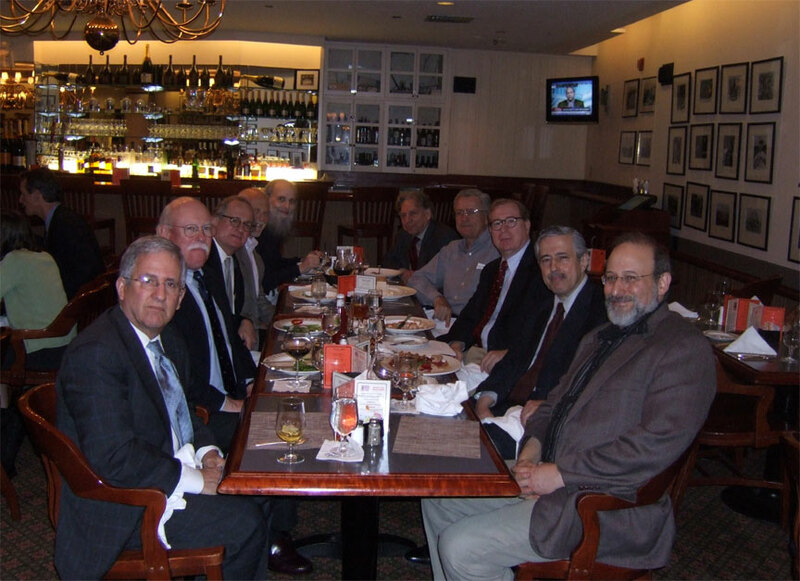 (From left to right) Steve Barcan, Paul Neshamkin, Norman Olch '64, Larry Kessler, '64, Fred Kantor, '64 (originally '63), Larry Neuman, Tom O'Connor, Joe Applebaum, Doron Gopstein, and Lee Lowenfish. Joe Applebaum had sent me an email in April telling that he would make the lunch and telling me of a review of a book about our classmate, James Yorke's work in Chaos theory (he coined the term). He said, "Jim Yorke, has had an exceedingly distinguished career as a mathematician -I haven't seen him since we graduated - as one of the discoverers of chaos theory. This week I saw a review in the Bulletin of the American Mathematical Society of a book that was published in honor of Jim's 60th birthday which gives some details of his accomplishments." He brought the article to the lunch and we talked about James and the many fine mathematicians in our class (Joe, also a math major, is now the Chief Actuary for the U.S. Government Accountability Office -- GAO). I've attached a copy of of the book review in PDF form here. By happy coincidence, I received an email this morning from James Yorke asking to be added to our mailing list (Columbia did not supply me with his email address). James writes, "Please add me to the distribution list of the class of 63 Newsletter. I graduated from Columbia College on June 4, 1963, two days after getting married to Ellen Davis who graduated from Barnard in 1962. In 1963 she received an MS in physics from Columbia. We both went to grad school at the University of Maryland where we got our Ph.D.s, she in physics and me in math. I am still at Maryland, and on July 1 I begin a 5-year term as Chairman of the Math Dept. My colleagues cannot figure out why I put my name in the hat for this job, but I think it will be fun. My web page http://yorke.umd.edu has other details. Bruce Miller told me about this newsletter." James I hope that your term will be fun indeed! Judging from the Fields Award on your web site, it is getting off to a good start. And thanks to Bruce for passing on the word. If you hear from any classmates who are not getting email messages from me it is because I don't have their address. Please have them contact me, and I will add them to my address book and Columbia College's. In response to the notice last month of Steve Bauer's death I received the following from Stephen Langfelder, "I read the sad news about Steve Bauer’s passing. Other than my four-year roommate Don Putnoi, Steve was the only really close friend I can recall from Columbia. We met as seniors in an accounting class in the fall of 1962, one of the few business courses given by the College at that time. Maybe our friendship started when we realized that our mothers had named each of us Stephen Bruce, or perhaps it was the bridge games that we enjoyed together, but we became fast friends and shared a lot of great times. Our lives had many parallels. After graduation, we both went on to Columbia’s Graduate School of Business, majored in accounting, and completed the program in one calendar year by beginning in the summer term of 1963. Not long after starting Brady and Thompson’s "Tax Factors in Business Decisions", Steve knew that he wanted to go into tax accounting. He was a tall, good-looking, well-spoken fellow, and the (then) “Big 8” accounting firms all wanted him. He chose Haskins & Sells, and, always on the fast track, eventually became a tax partner in the firm. He completed all four parts of the CPA exam with high grades the first time he sat for them. I was an usher at his marriage to Marian in June of 1964, and they both attended my wedding three months later. We stayed in touch for a few years, and then, as too often happens, our paths diverged. I did look for and see his name every year on the list of contributors to the annual fund drives of both the College and the Business School. One of the things good accountants learn is never to say “never.” Steve obviously learned that and a great many other things along the way. I will remember him, and I will miss him." You can reach Steve Langfelder at Langfelder@aol.com. Peter Landecker writes, "I am working on NASA space instrument programs with lots of hobbies, as noted in http://www.lafn.org/~bf684/index.htm. I am in excellent health, and enjoying life." Michael Hassan sent me the latest report on his travels, "So sorry for being unpredictable with readable stories. I have plenty of them but I have been spending all my time living them rather than relating them. I decided my investments were too narrow and took half my money out of the stock market and am investing it in international property. So far so good though this is not work for the faint of heart. More on the do's and don'ts of buying internationally later as I now have a relatively inexpensive yet hard won education. At any rate, latest effort, (after buying a condo in Buenos Aires in the famous Recoleta area, and a plot of land near Cabo San Lucas in Mexico), is the purchase of a small villa in Yalikavak, Turkey with a private garden and swimming pool. Sounds far out but actually is a short distance from Bodrum, a famous (for Europeans) resort on the Aegean Peninsula that stretches out into the ocean with some of the Greek islands a 10 minute boat ride away. Food and views are magnificent. Turkey has received a bad rap via the news media (in the states) and is safer, the people more industrious and more honest with a gorgeous topography. When I want the ocean I go to Turkey and when I want an exciting and inexpensive beautiful city, I go back to Buenos Aires. Once I get it furnished I intend to live there during the off season and rent it out in season. Same with Buenos Aires. The half acre in Los Cerritos, Mexico overlooking the beach and Sierra Madre mountains will either be flipped or built on, depending upon the tides of fortune. Hopefully, I'll find time to write up some of my experiences this year while roasting marshmallows in front of my fireplace in Yalikavak." Michael, send us some pictures to prove these fanciful tales! Frank Sypher's edition of "Poems from the New Monthly Magazine" by Letitia Elizabeth Landon (1802-1838) was published in May 2007: the 17th volume in his series of books by and about this prolific British author of poems, novels, short stories, essays, and letters. Earlier this year he published a biographical/bibliographical study: "The Donald M. Liddell Collection of Chess Books, and Other Volumes in the Liddell Family Library"; Donald M. Liddell was a prominent collector of chessmen, and author of one of the standard books on the subject: "Chessmen" (1937). His career as a consulting engineer is outlined in the introduction to the volume, which also includes many details on his family background, presented to explain the ownership inscriptions in the books in the library. Larry Litt writes, "I would like to get your advice about asking if anyone in our class might have a copy of our graduation year book with which they would be willing to part. I moved many times in the first few decades after graduating—to Harvard for a physics PhD; to Switzerland for a postdoc position; to Michigan for a faculty position; to Miami for medical school; and finally, to San Francisco for my academic anesthesia career. My copy of the yearbook vanished somewhere within those moves. Perhaps a discreet inquiry at your luncheons might be possible and sufficient. Otherwise, would it be possible to put a line in the news that a classmate seeks a replacement copy of the yearbook? If someone has a copy that can be surrendered, they should please write to me (Larry.Litt@ucsf.edu) to discuss the terms." Larry, I hope someone has a spare copy. I'll keep my eyes open on eBay, and also ask around Columbia.